When Bowie High School counselors organized Super Saturday, a morning jam packed with information for college-minded juniors and seniors, they made sure certain basics were covered: how to prepare for entrance exams like the ACT, the importance of essay writing for scholarships and how to apply for financial aid. They even had former students return to talk about their college experiences. Super Saturday also delved into something many college symposiums miss: how to look for sports scholarships, especially for those student-athletes who haven’t been soaking up attention since their eighth-grade year. “The assumption is that you play a sport, a college coach contacts you and you get a full ride, that’s it,” said Michelle Prokof, a college adviser at Carter-Riverside High School and former TCU soccer recruit. Prokof led the discussion about how the NCAA and NAIA work when it comes to scholarships, like who gives them, how much and what are the rules of recruiting. Bowie counselors wanted student-athletes to know more about how the game is played, and in some cases it, “really is a game,” said Prokof, who had to do some wheeling and dealing late in her senior year to snag a full ride to TCU. During the student panel at the end of the day, Kelsi Foxworth, Jennifer Monroy and Sydney Carr, former Bowie students now at Texas Women’s University, spoke about the high cost of college and how scholarships can help. Most of the students and parents wanted to know about their transition, how they coped with this new life in college. “Make the planner your best friend,” was Monroy’s advice. 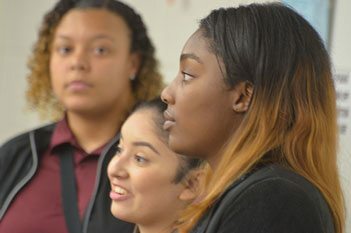 Pictured: Kelsi Foxworth, Jennifer Monroy and Sydney Carr, who made up the student panel at Bowie High School’s Super Saturday event, discuss transitioning from high school to college.